The Big Apple, New York City, is often referred to as the “city that never sleeps,” a place where nighttime entertainment is always just a block or two away in every direction. However, if you are visiting or simply new to the city, and looking for some of the best open mic nights, you’ll definitely have to be pointed in the right direction. Let’s face it. Open mic nights can be very bad or really terrific depending on the club and performer. Thankfully, New York is a breeding ground for new and emerging music, poetry and the spoken word, the performing of which has become very popular in recent years—at least in terms of the club setting. With a population larger than any other city in America, New York has more than its fair share of distinctly talented entertainers, and scores of clubs in which you can catch their acts. 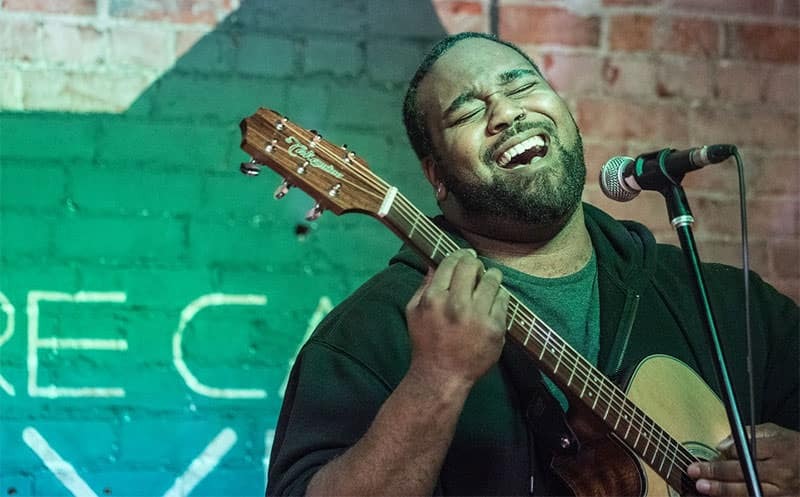 In the following article we will shine a light on several of the best open mic nights in the city of New York, and describe for you the types of talent you are likely to hear perform. One of the most well-respected settings for open mic-style entertainment, Prohibition has started several new singers and musicians on their way to super stardom. Prohibition is not like most open mic clubs in the city (think dingy basement bars), but an upscale bar and restaurant where romantically-involved duos can come for an intimate dinner or where a group of friends can gather around the bar and listen to some of the best live music in the area. The interior décor of Prohibition evokes a New York of old, with furniture and artwork that hearkens back to the Prohibition Era of the twenties and early thirties and creates an amazing and somewhat romantic ambience you have to experience to appreciate. Live music can be heard almost every night at Prohibition, but if you’re coming strictly for their open mic night you will want to clear your Monday schedule—the day each week when acoustic singers and musicians grace the Prohibition stage to try out their new material for the hefty crowds. The Nuyorican (a play on the word New Yorker) Poets Café is perhaps the cream of the crop when it comes to performing and listening to original poetry and other artistic forms. Founded in 1973, the club got its start as a living room-style salon in the East Village apartment of writer and poet, Miguel Algarin. A Professor of Literature at the time, Algarin had grown accustomed to seeing great poetry cross his desk from his serious (and not so serious) students, so he decided he needed to create a space where their beautiful work could be recognized publicly. The idea blossomed, and by 1975—and after several of the club’s poets had won awards—he decided the living room setting was just too small to accommodate all the emerging poets that had flocked there, so he first rented an Irish Bar to continue these readings, and by 1980, the Nuyorican Poets Café had moved to its final, and much larger location at 236 E. 3rd Street in New York. The mission of the Nuyorican Poets Café is—and always has been—to provide a safe space where artists who are underrepresented in the mainstream media can share their poems with other poets and poetry fans, and receive feedback and support from said group. Today, as a not-for-profit organization, the Café has emerged as one of the United States’ most highly respected artistic organizations and has become a renowned and celebrated forum for new and innovative poetry, music (including hip hop), comedy, theater and visual arts. The club is open seven days a week, so if you’re in New York and you’d like to stop in and share some of your original work, drop in and see what the Nuyorican Poets Café is all about. One of the most recognized clubs for new talent in New York, the Village Underground is a small club that has played host to some fairly big names (before they were famous) throughout its elaborate history. With seating for roughly 300 people, the atmosphere and vibe couldn’t be more intimate, and its basement location creates a sense of secrecy and suspense (like you don’t know what you’ll hear or see next). The Cabaret-style club is situated next to what used to be Old Folk City back in the 1960s. The Village Underground offers a variety of different bookings from across the musical spectrum. Past performers here have included names like Ike Turner; the “Godfather of Go-Go,” Chuck Brown; Patti Smith; Yo La Tengo; Me’shell NdegeOcello; and many more. The drinks are reasonably priced at the VU, and the bartenders and waitresses are always quick with a smile. Smoking is prohibited in the lower performance area, but it is allowed on the couch upstairs. Admission prices will also not break the bank, so be sure to tip your waitresses. Every Sunday night the Village Underground hosts an open mic jam session for up and coming R&B artists. The session generally starts around 8 and continues until closing, so if you have some new material you would like to share, be sure to call ahead of time so the booking agent can put you on the performance roster. Located in the Williamsburg section of New York City, Pete’s Candy Store is a great venue for catching some of the best live music shows from emerging regional talent. The club features gigs nearly every other night of the week, and the acoustics will want to make you come back time and again. Every Sunday night, Pete’s Candy Store plays host to one of New York’s best open mic nights, in which all types of musical styles are welcomed. Singers and acts are urged to call ahead on Sunday afternoon to secure their spot in the rotation.